Where else for esports but Las Vegas? There’s a lot of money to be made in that digital desert and the entrepreneurs of Sin City know an opportunity when they see it. Now, esports will join other headline sporting events with a new esports stadium in Las Vegas. A year ago, Allied Esports partnered with HyperX (the gaming division of Kingston Technology Corporation) to open a sprawling new esports venue at the Luxor Hotel & Casino. The new HyperX Esports Arena Las Vegas is the first dedicated esports venue on the Las Vegas Strip and is already becoming a major draw, with the Allied/HyperX strategy slogan ‘We’re all gamers’. The projections for revenue are enormous: last year, Allied held a Fortnite tournament that broke Twitch’s all-time concurrent viewer record. The partnership between Allied Esports and HyperX goes further, with HyperX becoming the Official Peripheral and Arena Partner for the arena, equipping gamers with HyperX headsets, mice, keyboards and mouse mats for esports tournaments, special events and daily play. HyperX was also an official partner of Allied Esports’ North American mobile esports truck last summer, which stopped at pop culture events around the US, including E3 in Los Angeles and VidCon 2018 in Anaheim. Allied chose CBT Systems as its integrator for the arena, which was converted from a former nightclub space. CBT Systems has lots of experience building workflows for broadcast, production, sports and AV and is increasingly asked to design high-quality workflows for large-scale live productions. For the 30,000 sq ft HyperX Arena, CBTS designed and built a workflow that is capable of supporting weekly 1080p 59.94fps tournament live streams to in-house displays and externally to Twitch. The arena includes front-of-house and back-of-house control rooms. The front-of-house control room sits on a second-floor balcony overlooking the arena and is where audio and lighting are monitored. The back-of-house space includes broadcast-quality production switchers, graphics systems and much more. Two dozen Panasonic cameras were chosen to cover the action in the venue and onstage: AW-HE130 three-chip and AW-HE2 compact FHD PTZ cameras. Two are placed in the commentators’ booth, two in the studio and 11 cameras are sited around the venue as ‘player-cams’. A dozen of the compact HE2s are available to be mounted above the players’ screens or to capture stage perspectives and the players’ entrance ramp. Additionally, two Panasonic BT-4LH310 4K/2K production monitors are deployed in the studio control room. More than 50 sources throughout the facility provide audiences with tournament coverage. 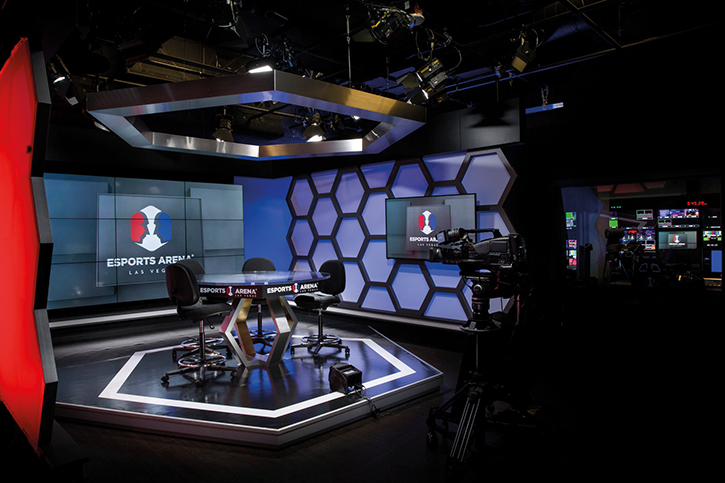 These include four studio cameras, 12 robotic cameras, 12 ISO cameras to capture individual players, three POV cameras, 12 computer screens, two robotic cameras and one pollcam. CBTS chose AJA Video Systems as its converter solution, with AJA ROI converters powering robotic camera and computer interfaces and AJA KONA 3G-SDI cards supporting desktop I/O on two Mac edit suites running Adobe Premiere. 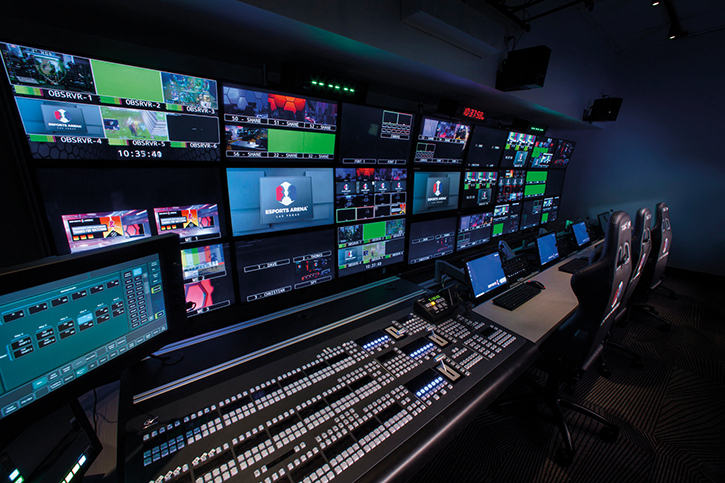 Sixty monitors in various locations are plugged into AJA Hi5-Plus 3G-SDI to HDMI mini-converters, which follow the broadcast monitors in the back-of-house production spaces. All source monitors running off a multiviewer pass through an AJA Hi5-Plus. AJA HA5-Plus and HDP3 mini-converters also power HDMI to HD/SD and 3G-SDI to DVI-D conversion, and eight FS4s are tapped for audio embedding and disembedding of individual channels. Despite its past as a nightclub venue, the arena required an overhaul of the existing audio system. Copper network services were replaced with fibre for maximum bandwidth and connectivity, and an entirely new audio system was specified and installed, consisting of twin 24-fader Lawo mc²36 consoles: one for front-of-house sound and the other to mix finished audio for live streams. These consoles are networked via RAVENNA AoIP using a Lawo Nova 37 router. I/O includes four compact Lawo stageboxes, each with 32 Mic/Line I/O, 8 AES I/O, 8 GPIO and MADI port. In addition, Lawo A__mic8 units provide AES67 AoIP connections for multiple mics deployed around the venue. AMX control systems and Martin lighting fixtures. As Wenhardt explains, investment in reliable and functional broadcast-quality gear is necessary because “esports productions are growing more sophisticated, and fans won’t accept anything less than the quality of productions they’re used to seeing on TV”.